why Malay parents send children to Chinese schools instead? poor quality of teachingsingle-race managementincreasing Islamisation seeping indisciplinary issuespoor maintenance and outdated IT infrastructure. Chinese schools have strict discipline, high quality teaching. have won hearts of many Malay parents. mere 4% non-bumi students attend these schools. Chinese primary schools boast more diverse racial make-up. promoting freer mingling among students of all races. Chinese primary schools not stumbling block to national unity. number of Malay children stands at 18 % this year. Chinese schools had 18% non-Chinese students. These numbers (in Chinese schools) expected to go up each year. five reasons middle and upper income parents stay away from national schools. 5. schools not maintained well, outdated computers. so that teacher able to guide other teachers well. if Indian teacher good in English, should be heading that unit. But preference given to someone not capable of guiding others. head of school should be most capable to run a school. should not be preference according to race. Parents just want someone who is capable of teaching, disciplining kids. constant clash between Muslim and non-Muslim parents. causing many non-Muslim parents to send children to Chinese or private schools. loved up-to-date computer and sports facilities at Chinese schools. this hampered fostering unity among races. labelled national schools Malay secondary schools. My comments : Actually this post is about Petronas, University Vice Chancellors and such. That "kabel" is our oil money. Oil money comes from our oil wealth. Oil wealth means Petronas. Plus all other oil companies that operate in Malaysia. At one time the dividends and taxes paid by Petronas to the government totalled RM65 BILLION !! Plus taxes and oil royalties paid by other oil companies operating in Malaysia, the gomen's financial survival is dependent on oil money. The point I am making is, we have been burning our oil money. So here is a question: Who will bail out Petronas? What if Petronas goes bust or Petronas runs out of cash, then which other cash cow industry do we have that can bail out Petronas and give the gomen money to burn? The quick answer is : None. This is the end of the line. So the gomen has no choice but to start milking the biggest cash cow in the country. There is a huge cash cow in the country. It is a real 'lembu'. That is you and me folks. We are now the lembu tunai (cash cow). Through the GST, we have stepped in to close the huge hole caused by the depleting oil revenues for the gomen. That RM40+ BILLION or so GST they are collecting every year directly from us is to plug the lost oil revenues. The oil money was a 40 year honeymoon. Now it is the dawn of the age of the lembu. Can they milk the population for RM40 - 50 BILLION each year? To answer this question, look at that list of Petronas bailouts again, items 1 - 7. Bank Bumi, MAS, Proton, F1, Putrajaya, KLCC, etc etc. All that money did not go into building capacity. All that money was used to REMOVE COMPETITION IN THE ECONOMY.In particular, all that money was spent TO REMOVE AND SHIELD THE MALAYS / BUMIS FROM COMPETITION. 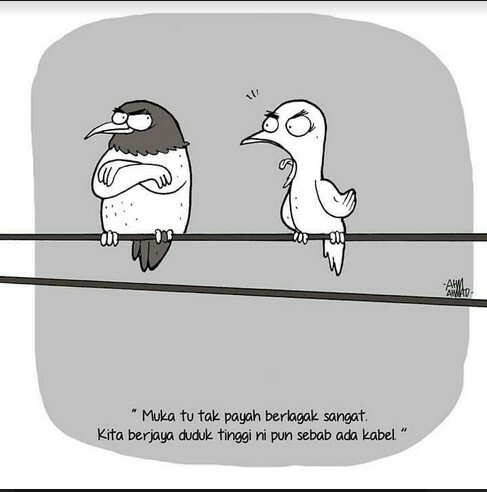 That is why that cartoon sent to me by my Malay friend is exactly to the point. For 40 years our oil money was used as wallpaper. To cover all the cracks and all the fungus growing on the walls. We did not use the oil money to teach Mr and Mrs Burung to build a solid, free standing house. (Berdikari went out the window). Now the party is over. The cracks are getting bigger. The fungus is growing through the wall paper. There is no more "oil money" to wallpaper all the problems away. So a large section of our population (ie the Malays/ bumiputras) will face problems trying to provide for themselves as well as pay that GST. They will become poorer. Now we go back to education. Education always has, it still can and it always willprovide the capacity for any community to advance itself - socially, politically, economically even "religiously" (they should grow out of it). Education is not just passing exams, learning chemical formulas or solving maths problems. Education is much wider than that. Education must mould people to become useful and competitive human beings who inhabit this planet earth. Useful not just to themselves or competitive not just among themselves but useful to all human beings and other creatures and competitive with the whole world at large. Now, why isnt our gomen school system doing that in sufficient enough quantity for the Malays / bumiputras? increasing Islamisation seeping inpoor teaching and delivery by teachers admin of national schools dominated by one race schools too Islamic disciplinary issues major problem schools not maintained well, outdated computers. Why are the Chinese schools (and now the super charged Tamil schools) doing so much better than the gomen schools? May I make a suggestion? Why not walkover to the Chinese and Tamil schools and ask them "Yo, what is your secret?" It was not always like this. Until the 1970s and early 80s our government schools were just about as good as any in Singapore or in other advanced countries. The Malay proverb says, 'bila sesat dihujung jalan, balik ke pangkal jalan'. So why not just go back to the fantastic system that we had until the early 1980s? Just undo all the damage that has crept into the system since then. Apa susah sangat? The wall paper experiment has failed. The 40 year honeymoon under the luxury of burning oil moneyis over. Malay readers, figure this out. Whether you like it or not, the Chinese people perform very well in their studies. Malaysian Chinese have become world class academics, professors and researchers. I know Malaysian Chinese who hold two professorships simultaneously - one here in Malaysia and another overseas (in Australia and one more in the US). They are internationally well regarded. And yet not one of our public universities in Malaysia (IPTA) have a Chinese as a Vice Chancellor. Seorang pun tak ada. Instead we have kangkung professors in so many IPTAs. And one Persatuan Professor Kangkung recently came out in support of the kleptocracy over the 1MDB scandal. That tells you how kangkung they are. So Malay readers figure this out. You send your kids to the local IPTAs to be taught by these professors. Do you think your kids have a good chance of graduating as first class performers? You think your kids can compete in the real world? This is a very sad cartoon. It is a very bad cartoon. Worse it is a very true cartoon.